As part of your routine dental examination, the first and most important check that your dentist will provide you with is an oral screening of your soft tissues. Regular dental check-ups are therefore important as oral manifestations can be early warning signs of other more critical systemic problems. The dentist will routinely examine the entire mouth for evidence of these. Where evidence is found this can be displayed to the patient on the chair-side screen using the intra-oral dental camera. Our fully digitised practice incorporates the use of digital x-rays, which are of a much lower dosage of radiation than conventional x-rays. In addition, the images are instantly available to assist with diagnosis and planning of treatment. 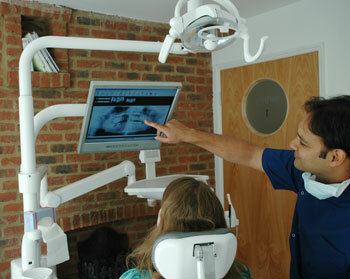 Images can be viewed by patients on the chairside screen as the dentist explains these. Your dentist is there to advise on maintaining good oral health and on the impact of a range of influences such as lifestyle and diet on oral health and hygiene.